For many sales teams there are two main “screens” when it comes to work: email and CRM. With the launch of our Gmail extension we made it much easier to use DocSend right within Gmail (stay tuned for other email clients ;)), and now with DocSend for Salesforce, you’ll have access to DocSend engagement stats right within your other screen, your CRM. DocSend for Salesforce lets you sync all your DocSend visit data straight back to your Leads, Contacts, and Opportunities in Salesforce. Knowing which sales collateral your prospects have most engaged with helps you know exactly what to highlight in your next conversation – as well as help you forecast – so we’re thrilled to provide this data in the same place you store the rest of your customer data, your CRM. This integration works out of the box as part of the DocSend Enterprise plan, or as an add-on to the DocSend Standard and Finance plans. To get started, simply sign into your Salesforce account within DocSend. Let us know if you’d like to schedule a demo! From your account settings page in DocSend you’ll see a new section at the bottom “Connected Applications” where you’ll be able to log in to Salesforce. As part of the Salesforce sync you have the option to create new leads for visits from email addresses that don’t have any matching leads or contacts in Salesforce. 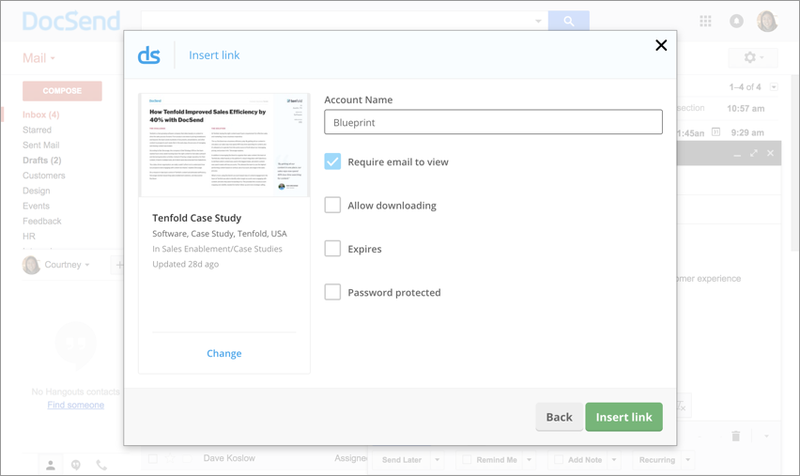 Once you connect your Salesforce account to DocSend you’ll be able to send visit activity from any link back to Salesforce, including links created within Gmail and our browser extension. If you’re the account administrator, you can adjust these settings for your entire team on your settings page. You can decide whether or not to create activities in Salesforce for visits, new leads, and unmatched records. If you enable “Sync visits,” all new DocSend links created by you and your teammates will have their activity sent to Salesforce. Individual teammates will not be able to change this setting when creating links. If you’re sending a link in a context where you’d like to keep tabs on viewers you don’t know, you can use the “Create new Leads for unmatching emails” checkbox. This way whenever new visit activity comes from an email address that doesn’t match an existing Lead or Contact in your Salesforce, DocSend will create a new Lead for you along with their logged DocSend activity. Ready to learn more? Drop us a note to schedule a demo. If you’d like to see DocSend integrated with another CRM let us know – we’re keeping close tabs on further integrations and look forward to making DocSend as easy as possible to use, wherever you need it.